The Kenwood TM-281A is a 2 meter FM mobile transceiver providing a big 65 watts of power. You get 200 multi-parameter memory channels (or 100 when used with names). This radio is capable of displaying up to 6 large alphanumeric characters. And the vivid amber display may be adjusted to 32 levels of brightness. Also, the front panel and microphone keypads are both illuminated for ease of use. Many functions can be tailored to your preference via the easy-to-use menu system. Built-in continuous CTCSS and DCS rejects unwanted signals. This radio has NOAA weather channels built-in with automatic alert tone (1050 Hz) detection. Multiple scan methods are available. Other functions include 1750 Tone Burst, power-on message, reverse function, key lock, channel display mode, busy channel lock-out and direct frequency entry. The menu allows for easy control and selection of various functions. The 281A is Narrow band FM ready. The TM-281A is tough enough for off-road assignments and meets MIL-STD 810C, D, E, F and G environmental standards for vibration and shock. Compact 6.3 x 1.69 x 4.69 inches (160x43x126mm). 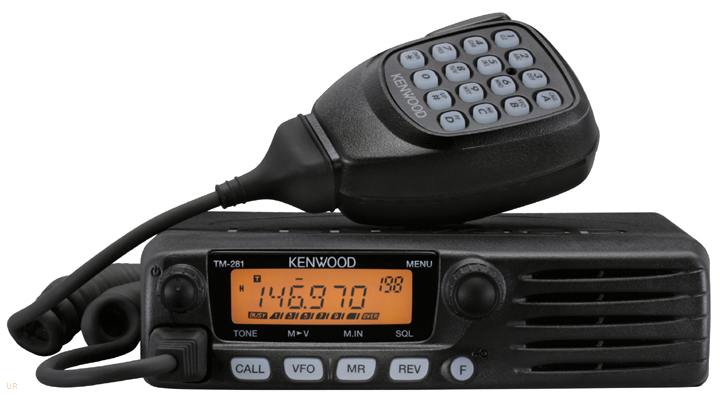 The TM-281A comes with illuminated DTMF hand mic, PG-2N power cord and mounting bracket. The MCP-1A PC Memory Control Software is available as a free download at www.kenwood.net. Programming CD and USB-K5D USB cable. REF CARD Nifty map sized laminated reference card for TM-271A/281A. Copyright 2011-2019, Universal Radio, Inc.